A letter from Bill Fahey Jr. I have some big news, as of Friday February 28th, I left my employment at Fahey Machinery after 21 wonderful years. It is a good move for me, as I am off on a new business venture and adventure, going off in a completely different direction, a direction I have wanted to head to for quite some time. TJ Hatfield is now at the helm of Fahey Machinery and with his guidance, Fahey Machinery will still be providing you with all the service and support in your machine tool needs. I thank all of you for years of partnership and friendship in business and wish you the best. 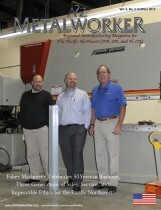 Fahey Inc. featured in Metalworker magazine. Our 50th anniversary was featured on the cover of the October/November 2012 issue of A2Z Metalworker magazine. Click the cover image or link to read the article online.